Milton Othello Reeves “Octoauto” in 1911. The line between visionary or eccentric, between progressive thinking, and outright insanity is often quite thin. During the formative years of the American automobile industry, the unbridled manifestations of a creative imagination blurred this line on thousands of occasions. As an example, on the visionary side of the line would be the optional swing away, electrically heated steering wheel available on the 1917 McFarlan. 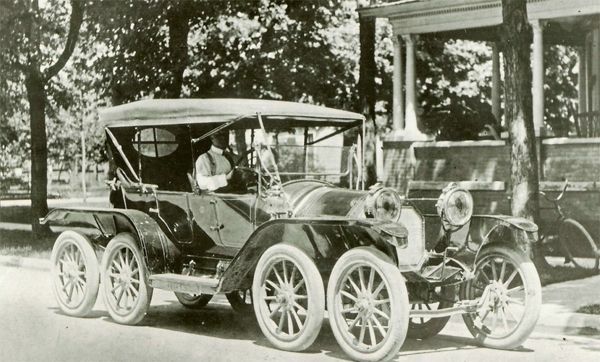 Indicative of the eccentric side are the eight-wheeled Octoauto with an astounding 180-inch wheelbase, or six-wheeled Sextoauto, devised by Milton O. Reeves. Often, what appears as eccentricity today was innovative technology during the first decades of the industry. 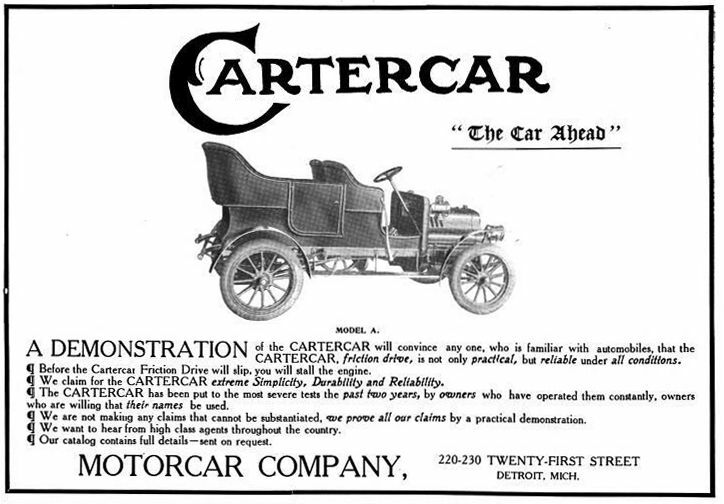 Promoted as, “The Friction Drive Car” was the 1907 Lambert, a vehicle that served to pioneer the type of transmission capitalized on with the patented developments of Byron Carter. Between the creation of the first experimental models by William Lambert in 1891 and the companies’ demise in 1917, a wide array of “interesting” vehicles rolled from the companies manufacturing facilities in Anderson, Indiana. Engines mounted in the rear, the front, or middle came in two-cylinder and four-cylinder configuration and provided power to one or two wheels, dependant on if it were a three-wheel or four-wheel model. 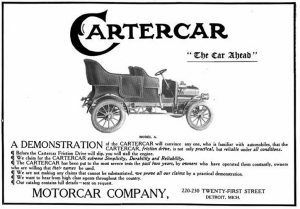 Lambert and Cartercar were not the only automobiles to utilize the intriguing system perfected by Carter. Other manufacturers including Metz, Petrel, Simplicity, and Sears honestly believed a transmission comprised of compressed paper fiber components rather than gears was a good idea. Even William Durant, the founder of General Motors in 1909 that the idea had promise. That is why he purchased the company and patent rights shortly after the formation of GM. Then there are those innovations that simply defy any semblance of reason, even in the context of the times when built. Case in point; the 1913 Duck, a four-passenger touring car with the drivers’ seat being in the rear of the car! The speed of technological advancement during these formative years quickly transformed a visionary development with potential for tremendous profits into eccentric oddities and sideshow curiosities. As an example, in 1911, compressed air starters that eliminated the need for the dangerous and strenuous hand crank were among some of the most innovative options available on luxury automobiles. The McFarlan, after the investment of a great deal of capital for development offered an in house designed and built unit as standard equipment in 1912. The system was utilized a four cylinder Kellogg pump operated by an engine turned shaft and a pressurized canister that stored air at 200 pounds of pressure. 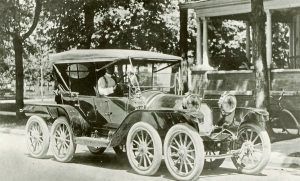 The ink had hardly dried on the companies’ promotion of this revolutionary advancement before the Cadillac division of General Motors was heralding its 1912 model as, “The Car That Has No Crank.” Charles Kettering had created the Delco electric starter and electric lights, standard equipment on the new Cadillac. By 1914, the electric starter introduced by Cadillac had rendered the automotive compressed air starter system an historical artifact. It also served as the death knell for electric and steam powered automobiles. 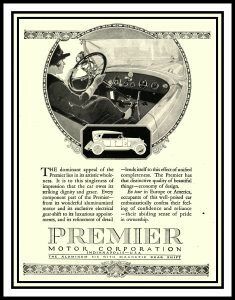 Premier Motor Corporation, 1920 Advertisement. Click for larger view. In an age of dramatic technological advancement, in an era when it seemed an exciting new world of mechanical wonder was looming on the horizon, the innovative features of an automobile often became its claim to fame in advertisement and promotion. Here too, the transformation of a company’s image from innovative to quirky happened quickly. 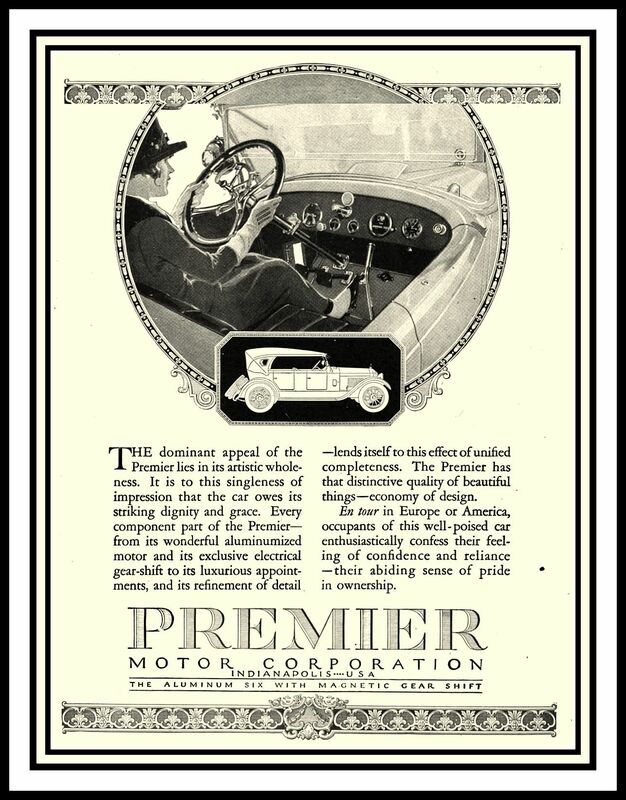 The Premier of 1918 was “The Aluminum Six with Magnetic Gear Shift.” Two years later the company that had manufactured automobiles featuring overhead valves, sliding gear transmissions, and shaft drive in 1904, was in its death throes. The troublesome magnetic gearshift proved to be the companies undoing. On more than one occasion, visionary and innovative thinking leapt ahead of the technological capabilities of the time. The first automotive recall in the United States, and the development of leaded gasoline, stemmed from an engineering equivalent of getting the horse before the cart. The air-cooled Chevrolet debacle of 1923 began with experimentation by Charles Kettering, the innovative genius behind the development of the electric starter that appeared on the 1912 Cadillac and transformed the entire industry, in 1918. 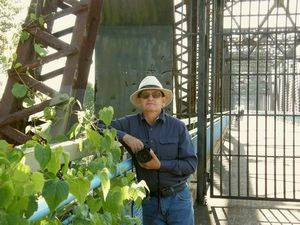 It culminated with a rush to production fueled by a power struggle for control of General Motors. Perhaps the most intriguing technological innovations from the formative years of the industry are those that were literally decades ahead of practical feasibility. 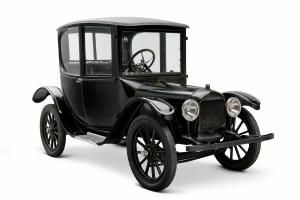 Consider the Woods Dual Power of 1916, a hybrid that utilized a four-cylinder gasoline engine as an auxiliary to the Woods electric motor featuring many of the engineering principles found on the Prius. The infancy of the automobile is littered with the wreckage of genius that crashed upon the rocky shores of high-speed advancement, warp speed technological advancement, and the changing needs of a fickle consumer. Consider the fact that the first automotive endeavors of Studebaker, a company that was the world’s largest producer of wheeled vehicles in the world during the 1870s, were an electric powered vehicle designed by Thomas Edison. Consider the fact that the patented VST (variable speed transmission) devised by Milton Reeves is the grandfather of the transmission in the Dodge Caliber. To be a visionary or eccentric requires independent thinking. From that perspective, during the formative years of the American automobile industry independent thinking reigned supreme.